The gap between the rich and poor in Canada is widening. 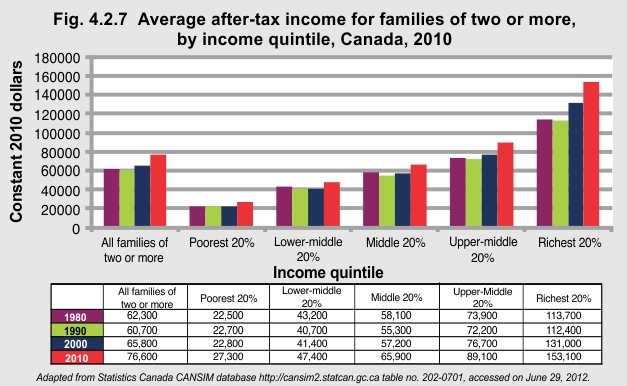 In 1990, the income of the richest 20% of Canadian families was 5 times the income of the poorest 20%. In 2010, the richest 20% earned 5.6 times that of the poorest. The bottom 60% of households had income increases of less than $8,000 from 1980 to 2010. The richest 20% had increases of almost $40,000 from 1980 to 2010. The living conditions that children and youth living in low-income families experience predisposes them to material and social deprivation. The greater the deprivation, the less likely families are able to afford the basic prerequisites of health such as food, clothing, and housing.